The Mighty Nein have arrived in Felderwin to find the town in ruin after a devastating attack by Krynn warriors. Nott has found an old friend’s alchemy shop burned to the ground with signs of a struggle in the rubble. She leads the Nein to an elderly woman’s home. Nott disguises herself as a young halfling woman and asks to see a boy named Luke. The woman named Edith and Luke both seem familiar with the halfling Nott is disguised as, and even name her Veth. Once Nott is assured that the woman and child are safe she returns to the Nein. Jester and Beau begin asking questions but Nott is hesitant to answer and asks to find a quiet place to talk. She brings them to the edge of the river and she begins to answer all the questions the Nein have. She reveals that while they know her as Nott the Brave, a goblin girl, she remembers a life as a halfling woman named Veth Brenotto. Veth had a hard life in Felderwin, being teased and tormented for her looks and odd behavior. But she found love in a brilliant young alchemist named Yezzah. They had a son named Luke. During a particularly rough crop year, the goblins near Felderwin attacked the city and captured Veth, Yezzah and Luke. Veth watched as her son began to starve to death in captivity and formed a plan to help them escape. She distracted the goblins while Yezzah and Luke ran. Never knowing if they escaped, she was captured and tortured by the goblins. They decided to kill her in retaliation for her attack and drowned her in the very river the Nein sit beside now. A goblin necromancer performed a horrible magic on Veth’s soul and reincarnated her as the goblin girl named Nott. After a year of horrifying servitude, Nott ran away and found Caleb and the Nein. Caleb quietly speaks up, taking Nott’s hands. He repeats Veth’s name, and says “my name was Bren Aldric Emendrud.” The rest of the Nein sit in silent shock as Caleb describes how the Cerberus assembly broke his spirit and mind and drove him to madness. He fears that the same is being done to the captured Yezzah. The Nein then begin to formulate a plan to try and locate then rescue Yezzah from the Cerberus assembly. Nott and Jester return to old Edith’s house and ask Edith to take Luke and run to Allfield where their friend Bryce will care for them. Meanwhile, Beau interrogate local guards to find out that Yezzah was actually seen being carried off by Krynn and not by the Cerberus assembly as the Nein feared. Plans quickly change and they begin to investigate the collapsed tunnels where the Krynn were last seen. Jester polymorphs herself into a Dire Honeybadger and begins to dig through the collapsed tunnel. After two intense hours she finally reaches an intact section of the tunnel. Transforming back into a tiefling, she pokes her head into the tunnel and hears running water. The Nein realize that the Krynn may be travelling through Wildemount by an undiscovered underground river. They silently step into the tunnel. Holy hells this was the episode we have all been waiting for!! Not one, but two great backstories revealed. The first half hour of this show is one of the more emotional moments I can remember in this campaign. Sam Riegel and Liam O’Brien both absolutely crush it this episode. I wish I could spend an entire article peeling back the layers that Sam Riegel has revealed over the last 49 episodes, but I’ll do my best to keep it short. Nott has always described feeling detached to her goblin form and never fitting in with the rest of the goblins. The intense fear of water was another massive clue. AND, some of my favorite layers that I completely glanced over were pointed out in the Youtube comments of this week’s episode. Nott the Brave is actually an anagram of Veth Brenatto. Aaaand Sam has also used variations of Veth Brenatto’s name in several different episodes. Quoted from Moni-chan on Youtube: In episode 18 Nott uses the name Veth. In the episode with Cali she called herself Bren. In the Hour of Honor she called herself Otto. Sam Riegel, I can’t even. Another interesting tidbit I completely forgot: When Nott introduced herself to Calianna as “Bren” you can see Liam physically react to the name and stare long and hard at Sam and Matt, thinking they may be using Caleb’s true name against him. This moment is also referenced by Nott in this week’s episode after Caleb reveals his true name. With all the fan theories that have been flying since episode 1, I knew that there was more behind the stories of Nott and Caleb (and Beau, but we haven’t gotten there yet.) But, I don’t think I was fully prepared for the emotional story behind Nott/ Veth. Caleb Widogast threw his full name around far too much for a man in hiding. Someday soon we will have to get the full story out of him. 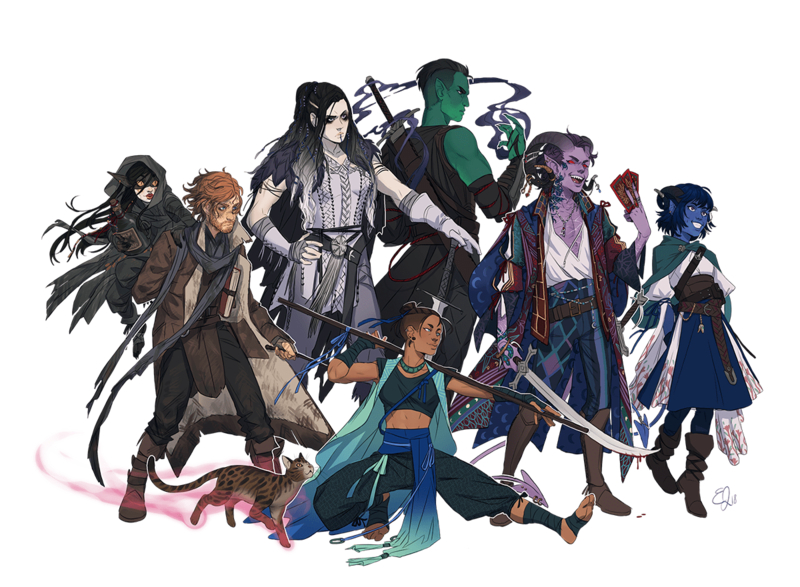 With the party possibly headed to Xhorhas to rescue Veth’s husband Yezzah, we may get to see more Yasha backstory. Hopefully the gorgeous Ashley Johnson returns in time to play out her story for us. Between the Sheets is back! The first episode of Season 2, featuring Logic, is now available on YouTube. Sam’s incredible wife Quyen Tran is the guest in Monday, February 4th’s episode. You don’t want to miss it! Keep and eye out for the VOD release of The Search for Grog, due out sometime early February. And just in case you need hours more Critical Role content to binge, ALL of Talks Machina (and After Dark) are now available to watch Here on Critical Role’s website!